This book presents a series of case studies illustrating the fundamentals of Agile development and Agile design, and moves quickly from UML models to real C# code. The introductory chapters lay out the basics of the agile movement, while the later chapters show proven techniques in action. The book includes many source code examples that are also available for download from the authors’ Web site. 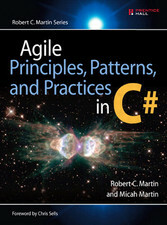 Whether you are a C# programmer or a Visual Basic or Java programmer learning C#, a software development manager, or a business analyst, Agile Principles, Patterns, and Practices in C# is the first book you should read to understand agile software and how it applies to programming in the .NET Framework..